A fine 1992 U.S. Geological Survey map of Iapetus or Japetus, the third largest moon of the planet Saturn. A large portion of this map depicts the large dark area of Iapetus, the Cassini Regio, named after Giovanni Cassini, the discoverer of Iapetus. The North Polar Region is featured in the upper half of the map. This map is based on the images from Voyager 1 and 2. 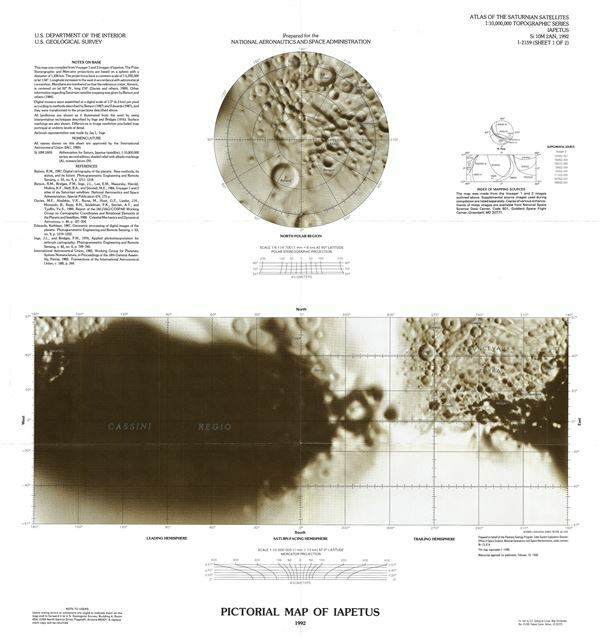 This map was prepared for the National Aeronautics and Space Administration and published by the U.S. Geological Survey as Atlas of Saturnian Satellites Topographic Series map I-2159 sheet 1.